As you know IBPS has released the notification for the recruitment of Probationary Officer for 2018. The total number of vacancies for the recruitment is 4252 and the preliminary exam is scheduled in this month of 13, 14 and 21 of October. To download the hall ticket click here. We all know SBI has conducted exam this year with the change in pattern. IBPS also followed the same pattern as SBI with the sectional cutoff included in the Preliminary exam. SBI also has surprised in all the shifts of the exam and we are thinking that ibps will also follow this exam level. Don't think about the level of exam just give your best 100%. 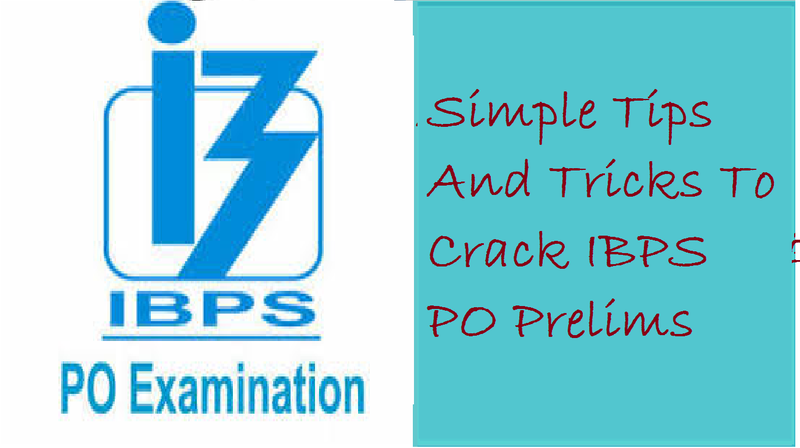 Concentrate on your study and follow the following set of rules to clear the IBPS PO Prelims. Getting a Job in the bank as PO is the dream of every aspirant. Also, IBPS PO gives you a handsome salary with the lots of perks and facilities. You know how satisfying PO job with PSBs could be, Set your priorities straight and start preparing for the exam right away. Before getting started with anything you must know the examination pattern for the exam is, and how you should plan your preparations so that you are able to do with the syllabus well ahead of the time when the examination takes place. As per the IBPS Notification in the English Section, you have got enough of the time to solve the questions, i.e., 20 minutes for 30 questions. Earlier, In the pre-2017 examination, students will be given only 10 to 15 minutes for the English section and thereby solving the questions of the Quantitative Aptitude or the Reasoning Ability Section that are comparatively time-consuming. But, this strategy won't be working anymore as 20 minutes slot out of the total 60 minutes set for English Section as per the IBPS Notification Practice question online as much as you can. Try to solve 2 to 3 practice paper of English section. There are lots of websites who provide online material for the examination. Now you don't have much time to learn basic so we suggest you go through the online material available on the internet and practice that question. In any aspect Accuracy should be the priority while attempting English section, If you have dought in any question it is better to skip that question because one wrong question will cost you with the deduction of 0.25 marks from your right answer. Reading Comprehension is one of the best section for one who thinks that he/ she weak in English. The best part of Reading Comprehension is that if you are weak in grammar it doesn't matter you just have to read the paragraph and solve the question but for this, you must read 2 to 4 article daily from the HINDU Editorial. In RC you firstly you have to attempt the questions based on vocab and phrases first and then the questions based on RC. The weighted of Cloze Test is also good around 5 to 7 question will ask, so you have to focus on the important topics which are verbs, subject-verb agreement, preposition. With 20 minutes you have to solve the 35 question. The reasoning is one of the scoring subjects in the banking exam. But you have to practice, practice and practice with all your heart and soul. Start with the questions with questions based on inequalities, direction and distance, syllogism, coding-decoding, alphanumeric series, and other such random topics try not to solve first the puzzle formed question it takes time to solve keep in mind you have only 20 minutes to solve the questions. Once you did with all this question go through simple puzzles and sitting arrangements. Try to attempt the maximum number of questions in minimum time. Go through the basic easy questions by skipping the hard one. Try to solve the easy question in less time and attempt the hard puzzle and other question later. Earlier, In the pre-2017 examination, students will be given 25 to 28 minutes for the quantitative aptitude section but unfortunately, that is not happening this time. As IBPS has restricted the time to do this maths section to just in 20 minutes. Quantitative Aptitude needs the maximum of your hard work and practice to score good mark in 20 minutes. To crack the quantitative aptitude section you have to give at least 4 to 5 quantitative sectional online tests daily and practice hard. During exam attempt the basic and simple questions on Simplification, Approximation, Quadratic Equations and Number Series first as you would be able to solve the maximum number of questions within minimum time. After attempting all these questions accurately, go for Data Interpretation. In every DI set, 3 to 4 questions are always doable and the rest are calculative.